Will the Midterms Be a Disaster For Republicans? This week we learned from the Washington Post…that special counsel Robert Mueller plans to release a report about President Trump’s actions while in office discussing the issue of obstruction of justice. It will probably be finished by June or July. Next week, Facebook CEO Mark Zuckerberg will testify before a joint hearing of the Senate Judiciary and Commerce committees on Tuesday and before the House Energy and Commerce Committee on Wednesday about the improper gathering of personal information from Facebook by Cambridge Analytica from nearly 90 million people, most of them Americans. Taking all of these events together, the natural course of Mueller’s investigation will be to drop bombshell matters of profound importance about the Russia scandal on the Republican Congress from now through the midterm elections in November. Mueller’s conclusions about obstruction of justice, which probably will explode into public view by June or July, will rock Congress, especially Republicans running in 2018. If Mueller does charge that the president committed obstruction of justice, the minute that report becomes public (which it certainly will one way or the other) there will be a huge public firestorm. The issue of impeachment will take center stage. There may well be revelations during the hearings about Facebook’s relationships with Russia and with Cambridge Analytica while Mueller continues to pursue investigations, indictments and plea bargains surrounding these matters. It would be a disastrous and historic mistake for Republicans to attack the investigators, the investigations and the media in the face of ongoing Russia-related bombshells produced by Mueller’s investigation. Republicans who do so are on the wrong side of history, the wrong side of the facts, the wrong side of the law and the wrong side of the politics. He’s right. Greenfield also regrets a Planned Parenthood staffer tweeting: “We need a princess who’s had an abortion … who’s pro-choice … who’s an undocumented immigrant … who’s actually a union worker … who’s trans.” I’m not sure why, however. What could more accurately reflect today’s Democratic Party? My anecdotal sense is that countless liberals are drawn to the never-ending, numbing procession of TV panel after TV panel, all focused on the Mueller investigations and what they might yield. (Stormy Daniels has now become the second obsessive subject.) Whenever I click on CNN during prime time, it feels like Groundhog Day. Each hour seems to promise that any minute now, federal marshals will parade down Pennsylvania Avenue with warrants and cuffs. And for many Democrats, the promise of a House takeover in 2019 is that impeachment hearings will begin roughly 30 minutes after Paul Ryan hands the gavel over to Nancy Pelosi (or her successor). Of course, if the Democrats succeed in capturing the House, impeachment proceedings will indeed begin in around a half hour. But I think his point about the Democrats’ fevered hopes in Bob Mueller is well taken. Greenfield thinks the Democrats should concentrate more on the issues. I hope they do, since that is where the Republicans can win. 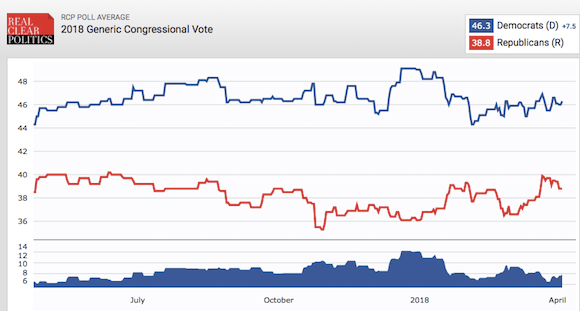 No, I do not think there will be a blue wave come November. Mid-terms are traditionally tough on the incumbent party. But the Senatorial map favors Republicans and many observers expect the GOP to pick up a few seats. I think that is correct. As I write, the House roster lists 238 Republicans, 192 Democrats, and has five vacancies. In 2010, Barack Obama lost an unprecedented 63 seats in the House. But that was in the aftermath of Obamacare, perhaps the single most unpopular piece of governmental imposition in history (excepting only the 16th and 18th Amendments) and the rise of the tea party. Sure, it is possible that the Republicans will lose a few House seats. But Trump’s increasingly broad-based support and the astonishing success of his agenda make it just as likely that the Republicans will gain a few seats. I hope Roger is right, but frankly his view strikes me as rather rosy. The Democrats are ahead, of course, but that doesn’t mean a lot. They usually lead the generic poll by at least a few points. But generic polls tell us little about specific races. Moreover, the Democrats continue to deal with a fundamental problem: their voters are concentrated in too few districts. It doesn’t make any difference whether a virtually unopposed Democrat in an urban district wins with 52% of the vote, or 95%. A seat is a seat. So for now, at least, we are thrown back on intuition. My own guess is that: 1) The Democrats currently enjoy a wide enthusiasm gap, due to their insane hatred of President Trump. 2) That enthusiasm gap will narrow as the campaign gets underway and Republicans get more engaged. 3) The Democrats will almost certainly gain seats in the House, but it won’t be anything like 2010 if only because there are fewer swing districts now than there were then. 4) Republican Congressmen and Senators running for re-election have a significant advantage, especially compared with Democrats running in 2010: they haven’t voted for anything unpopular, and they can claim credit for the popular (and successful) tax reform bill. 5) Taking all of the above into account, I think the Democrats have a good–55%-65%–chance of retaking the House, while Republicans will gain a few Senate seats. All that said, here is 6): the midterm elections will turn largely on events that haven’t yet happened, and that we cannot yet foresee.